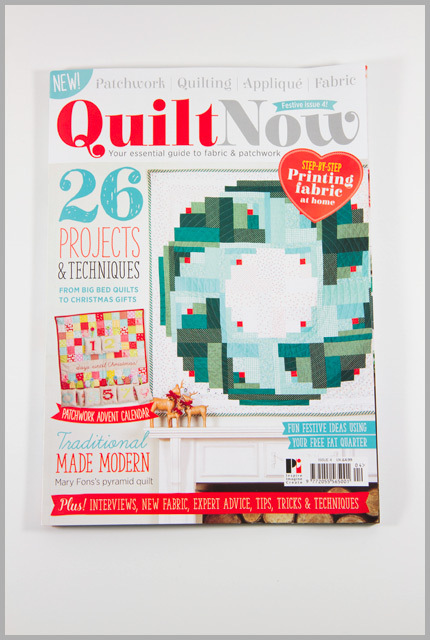 So in amongst all the other things that have been going on lately, I have been regularly producing things for Quilt Now magazine. Issue 4 has been out for a wee while now, but there was a bit of an issue converting some people from the 3 reduced price to full price Direct Debits, so I was only just able to get hold of a copy. Using some fun Robert Kaufman Merry Moustaches fabric, I made a pocket Christmas stocking. Now there was a reason for the pocket – round here Santa always leaves some shiny coins, which always, without fail, end up jumbled up in the oranges and apples he also leaves at the bottom of the stocking, so there’s always that challenge to get them all out without half your coins rolling irretrievably under the sofa ;o) I figured other people would also have some wee gifts they didn’t want to get lost, so there you go, a pocket Christmas stocking. But that's a Christmas tradition! A satsuma and a soon to be lost 50p in the foot of your stocking. *g* I've actually just tonight finished stockings for my Maw and Paw. I know what they're getting in the toe now! But yeah, genius idea the pocket! Now we have a new tradition in our house! And the kids will be thrilled, because, quite honestly, the old tradition included potatoes!!! (Im hoping the hubster gets the idear and leaves a small bejewelled gift in that pocket, myself! You really put potatoes in your stockings?! hahahahaha! Way to go Katy!!! 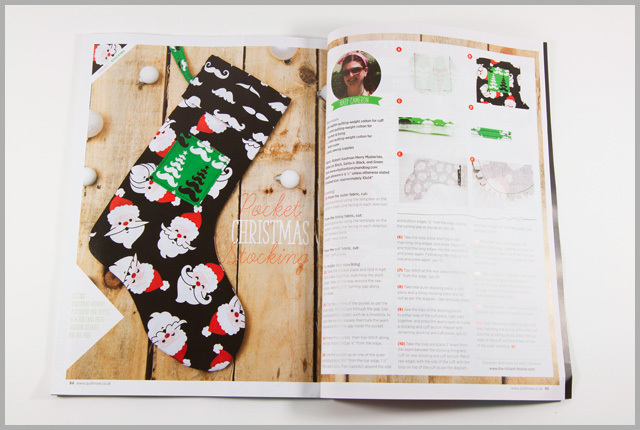 Love the pocket on the stocking …I wonder if Father Christmas will take the hint about leaving cash if I make up one of these ? If Santa would just fold some of the paper cash into the pocket it would be able to roll around and get lost – genius! That should say "would not"
Cool stocking! What's good idea to add a pocket, at first I thought the pocket might be where you put Santas cookie to bribe him into giving you the best presents. Yay you!!! That is great! It might be time to make more stockings around here. It wont be long before all the stockings are hung. good idea for the pocket. Potatoes in a Christmas stocking? Well, how cool is that!?! Cash over spuds any day. Great idea Katy. I love the stocking and the tradition of a few coins plus the fruit sounds really fun. We have a chocolate tradition in our house.